It was even better than I expected. The Jamsheed Syrahfest that is, a night last week spent getting stuck into Gary Mills’ fine 08 Syrahs in a back to back, cool climate Victorian red love-in. 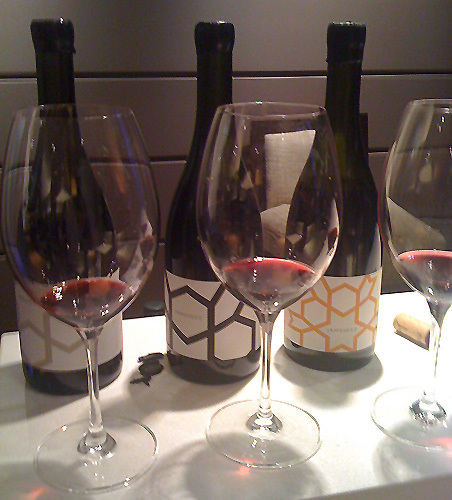 A love-in that showed just how very good these three wines were (and amazing value given the quality). In fact, the only challenge here was working out a favourite (which I did after carefully drinking several glasses of each). $40. Diam. 13.5%. 100% whole bunch and wild yeast ferment. Unfined and unfiltered. Sourced from a vineyard on the slopes of the Coldstream hill in Gruyere with typical Yarra grey loam. $40. Diam. 13.8%. 100% whole bunch and wild yeast ferment. Unfined and unfiltered. Sourced from the red ‘Monbulk’ soils of the southern Yarra. Terrific and exciting wines. I've only tried the Gruyere, but have the Garden Gully waiting at home. I've got a couple of bottles of the Riesling at home too. Very much looking forward to it. Ah, interesting. I'm planning to post a review shortly of a "Garden Gully" 05 Grampians shiraz (no mention of Jamsheed on the label) that I thought, not knowing the label at all, was unexpectedly excellent. I was rather struggling to work out who produced it, as the website refers you to Grampians Estate. Reading your note, it maybe sounds like the same vineyard as the Jamsheed GG …? One and the same Sean. I believe that the fruit will continue to be sold to Jamsheed but the actual vineyard is now owned by Grampians estate. 40 year old, well tended vineyard (aparently).